So I've decided to hoard all things pretty and sweet until next week for a big fat Valentines edition of Thrift Thursday. But today, I'll share with you this weeks finds. Slim pickings this week, though I did make a big time score for our own living room (I'll share this biggie later this week) and some perfect fabric to cover it. 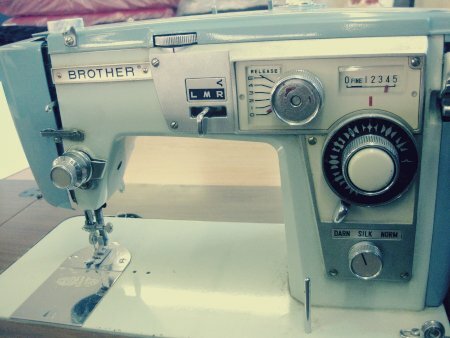 Maybe I could sew it together with yet another amazingly pretty vintage sewing machine??? I never tire of these. 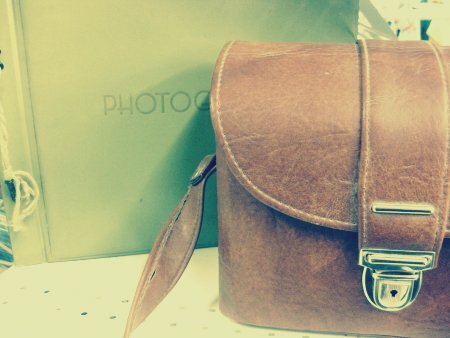 I also came across an very cool old camera bag (great for slrs!). With it were piles of old paper albums. These are super easy to find. They're so inexpensive (like under $5) and make amazing scrapbooks. I've used these for portfolios to show my work in the past too, and they can be hand painted or papered for a fresh look. 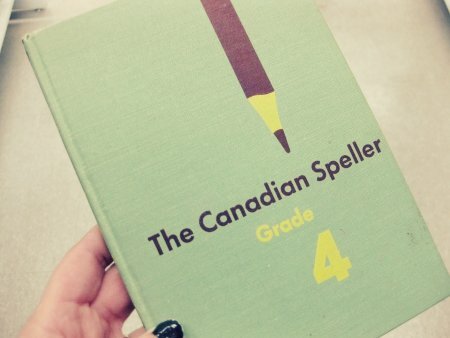 A vintage speller. Without spell check, I would need this. FYI - bad spelling and low I.Q. - no correlation (i sp'd that last one, just in case). Here's a guy with a high I.Q. but freaky yellow eyes. 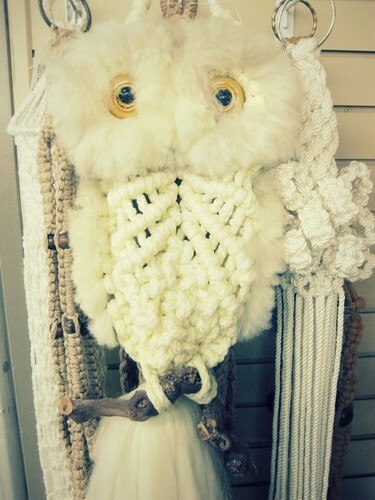 If I were seriously in the market for another macrame owl, I'd probably paint his eyes all black. Otherwise, he's pretty smart for $5.99. These guys are at the opposite end of the spectrum. Hello crazy! 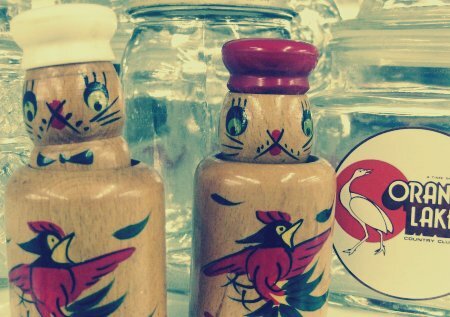 Still, little wooden Japan made vintage housewares is always worth a second look. I love when they're labeled "Salty" and "Peppy" best of all. 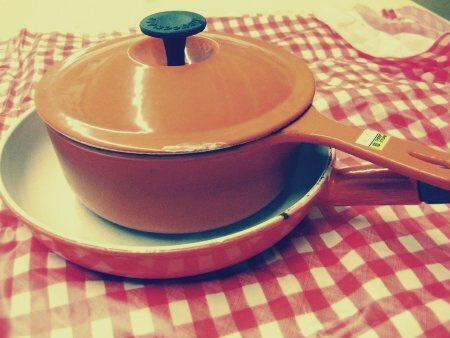 Lots and lots of colorful cast iron pots and pans this week. Maybe I was just looking for them. After falling in love with the fabric above, I'm feeling soooo good about orange. Maybe I just need some vitamin C.
And since I'm getting in the habit of ending Thrift Thursdays with something a bit strange, here's a sweet scene. 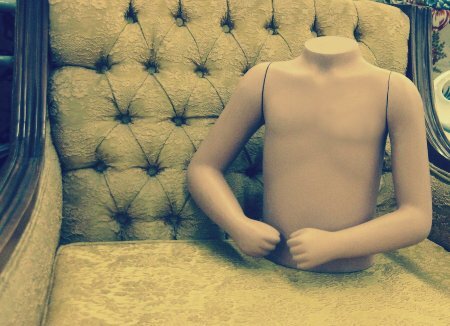 Kind of wondering if there ever were legs for this torso, and why I considered buying this for a second. I did love this chair. It reminded me of these chairs of Elsies. My chair hording side really fought for me to buy this one, but another more wiry one was already filling the back seat. hehe. I'll show you soon! Thanks for Thrifting with me friends! It was thin pickings this week for me, but it was still fun looking. Have you found anything cool second hand lately?